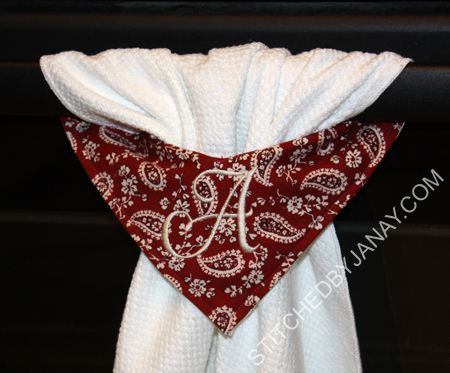 Since her kitchen is decorated in burgundy and beige, I selected this fabric from my stash, and added their last initial with 8CP's Sherry. 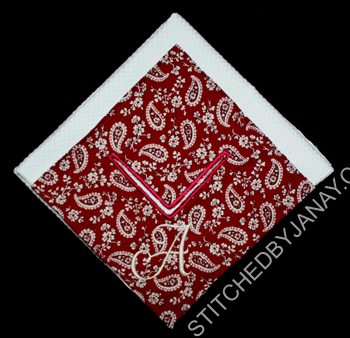 In December I shared my first project with Savvy Stitches' Split monogram, and now I can finally share pictures of my first project with SSA's Split Monogram Applique! 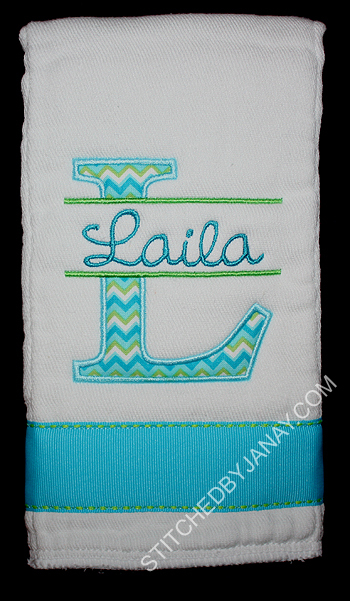 Since the burp cloth was for a girl but we were avoiding traditional pinks, I wanted to be sure to pick a feminine font for the name. I love the capital L in 8CP's Candi font! I love getting emails from Tiffany! (And I'm pretty sure I've started a blog post with that exclamation before.) She always has a vision for unique and meaningful gifts -- the kind of inside jokes that only the recipient will really get. It's so much fun to make her visions a reality! 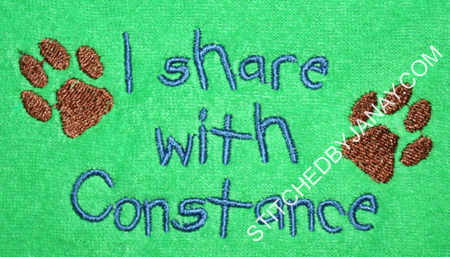 One item is an "I share with..." bib; Constance is the family dog. 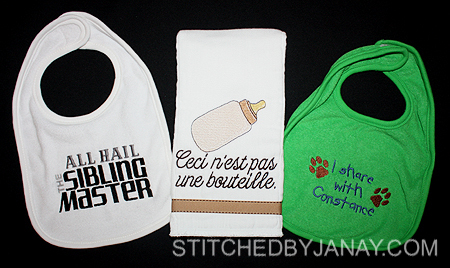 (It's hard to believe it's been over five years since I made the first bib like this that she requested!) 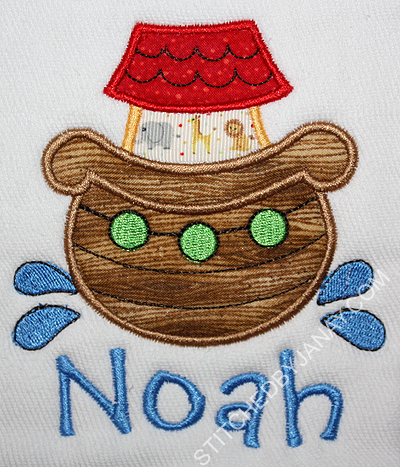 The text is Embird Alphabet #18, and the paw prints came from Sew Forum (no longer available). 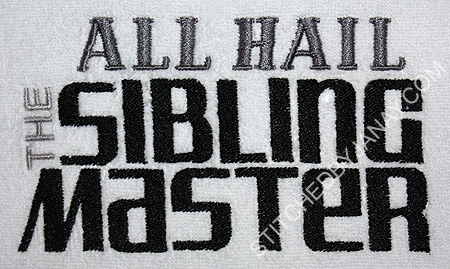 The other bib has the words: "All Hail The Sibling Master!" (She said, "It's a funny term they've started using after someone described the baby's relationship to the dog--the aforementioned Constance--in that way.") I used 8CP Fonts: Pottery for the top line and Arizona for the bottom line. 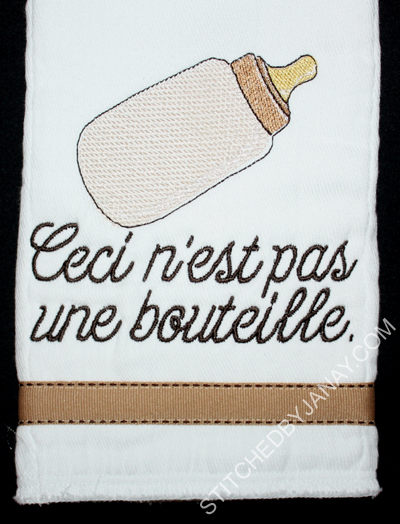 Finally, the burp cloth is a play on Rene Magritte's painting "Le Trahison des Images." Tiffany said in reference to the dad, "One of his courses is literary theory. Magritte's pipe is a starting point for a lot of discussions and...well...I'm sure you math people have a lot of jokes that are only funny to other math people, right?" The bottle is a Grand Slam design, and I added the text with 8CP's Brass (retired). 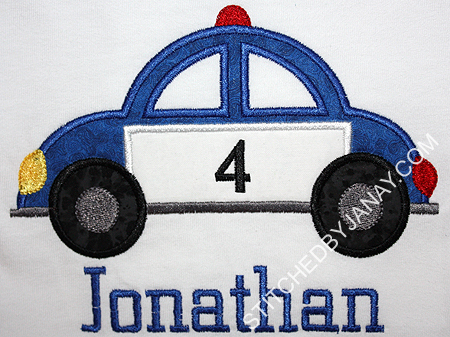 The police car applique is from Planet Applique. 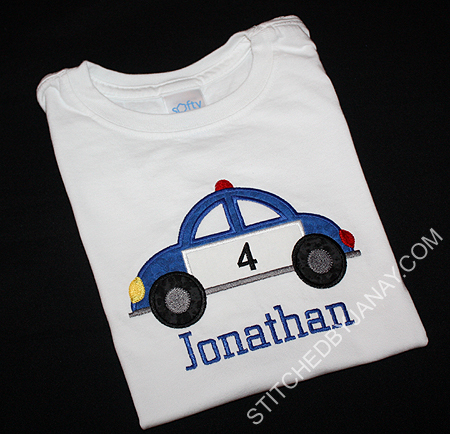 I substituted the word "POLICE" for the number 4 -- his age. I used 8CP's Serif font to add his name. 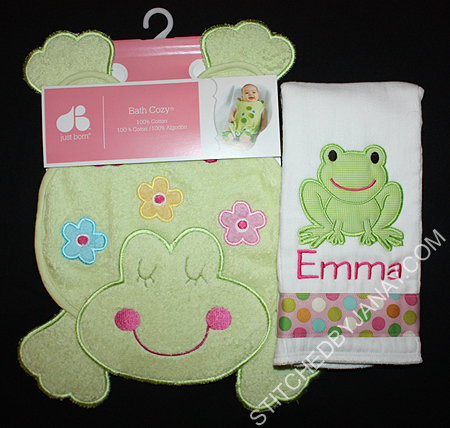 A friend of mine has a brand new granddaughter and asked me to make a few items. 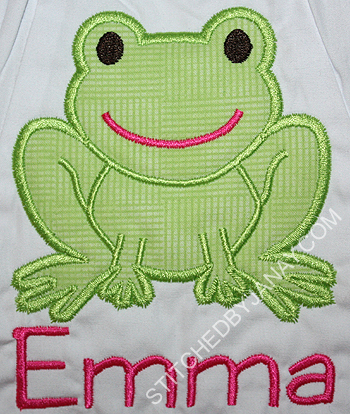 Out of all my frog appliques, she picked this cute one! 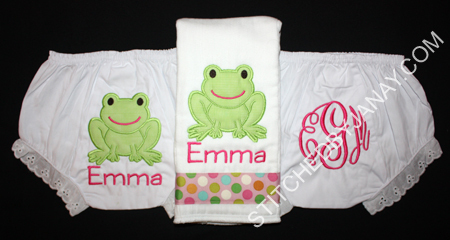 The frog applique is from 8 Claws and a Paw, as well as the font Alex. 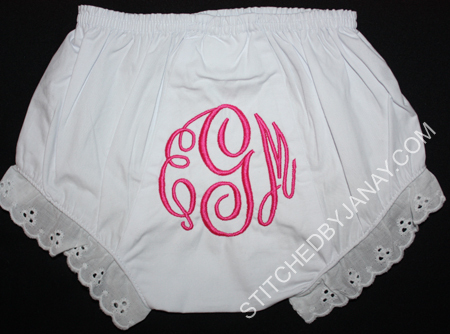 For the other pair of bloomers she wanted an elegant circular three-letter monogram; Fancy Circle monogram from the Itch 2 Stitch was perfect! I love my Vera Bradley purse. When the print I wanted was discontinued I watched the online price carefully until it got low enough that I could justify buying it, and I bought two coordinating napkins so I could make my own accessories. I made one key fob three months later, and then five months after that I made a second key fob that was longer in length. And then nothing... no more in-the-hoop accessories even though I had lofty goals. I've used the purse for 2 years now and it's starting to show it's age, especially the handles with exposed batting. Before retiring the bag, I decided to attempt repairing it myself with the napkins I still had laying around! I am blown away by how just a little bit of effort made a huge difference in the appearance! I don't really have good pics of how I did it. 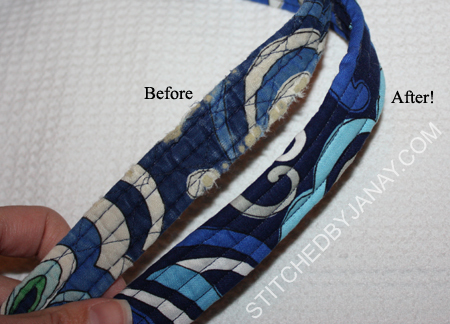 I just cut 3.5" strips, wrapped them around the handles, folding in the outside edge, pinned in place, and stitched three quilting lines like what was already on the handle. It's not perfect, but it sure looks better than it did! 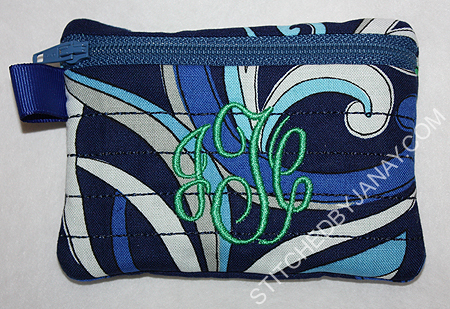 The first two cases are from Embroidery Garden's Zipper Cases set. 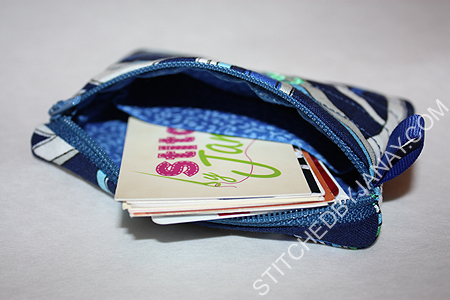 This is the debit/business card holder. 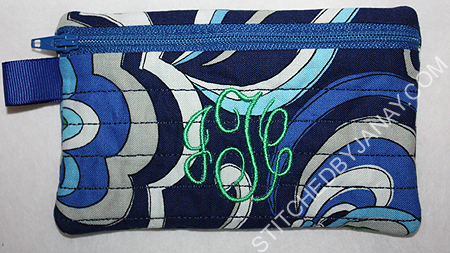 I used the Smaller Fancy Circle monogram from the Itch 2 Stitch. 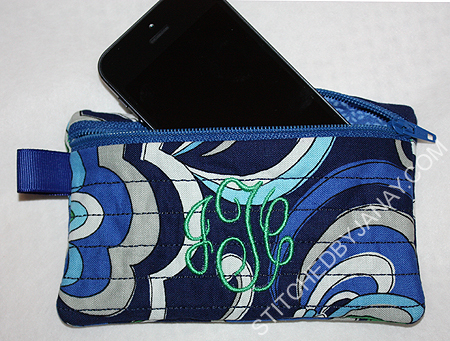 I also made the iPhone case. I wish I could claim that this was on purpose, but check out my happy accident! 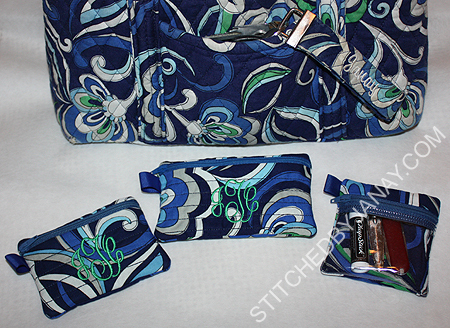 I could not have matched those fabrics along the zipper more perfectly if I tried!! 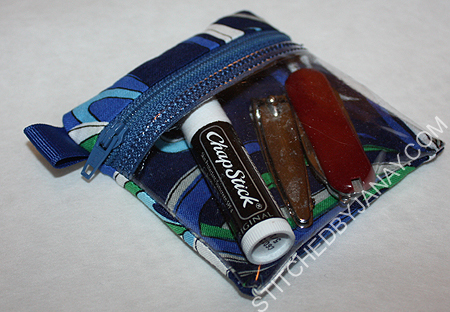 And finally I made a see-through case. 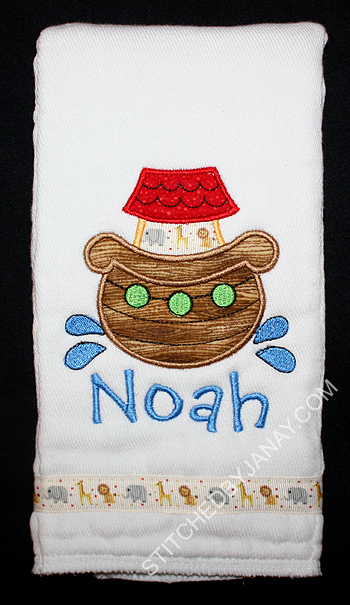 This 4x4 design is currently a freebie on EG's Facebook page, so if you do machine embroidery, go grab it fast! 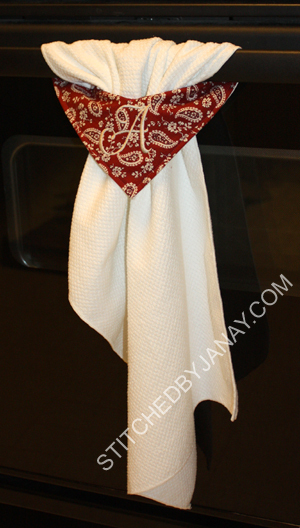 Let me add that I use Vera Bradley napkins for personal use only. I haven't done any research, but I'm guessing their fabrics would fall under the same category as licensed fabric which is not intended for commercial use.